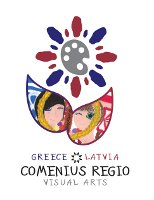 COMENIUS REGIO partnership between Florina Region (Greece) and Dobele Region (Latvia). This website gives an overview of our project activities. Between 2013 and 2015 both regions are working together to improve the quality of primary education, through the exchange of mutual experience, and to adopt good practices in the field of local art education and task - based learning. Viewing art as an integral part of the community life, this project focuses on the local artists of Florina (Greece) and Dobele (Latvia), which reveal the social reconstruction practices. In this way, students, with a different cultural background, will find equal opportunities to educate and incorporate themselves as part of the local society.